We took the 8-hour Phang Nga Bay tour (PK12) offered by Royal Caribbean Cruise at 94.90 SGD. The first stop of this tour – Suwan Khuha Temple, is about a 1-hour drive from the Phuket beach. This temple is where numerous Buddha statues standing, reclining, and seated are located. Locals call this place Wat Suwan Khuha or simply Wat Tham, which means cave temple. It is in a limestone mountain, or karst, riddled with cavesin various sizes. The biggest cave is the lowest and serves as the entrance. It is much bigger than the other caves: 20 meters wide, and 40 meters long. The highlight of the place is a 15 meter long Reclining Buddha of great beauty. The entire cave temple can be explored in 10 minutes – do watch out for the rather slippery steps in the innermost caves where you can get a spectacular view of the limestone structures. Unfortunately, the cave, as with other tourist attractions suffer from vandalism – the sign of “No writing” remains unheeded. 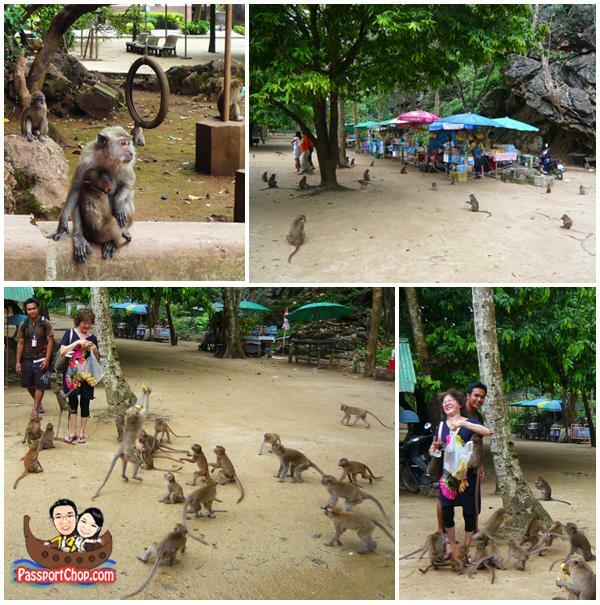 The other “attraction” at this site is the gang of monkeys that roam the grounds around the cave temple. Watch out for your cameras, wallets or any loose-hanging items as the monkeys are known to be quite aggressive by snatching and running away with your possessions before you had the chance to react. There are also a number of fruit stalls where you can buy bananas to feed them – however, be prepared to be mobbed like in the case of the lady in the picture below. Inside a cave look amazing!! nice reclining Buddha… The other distinguishing feature is the local population of monkeys too. Cool pics! Liked the monkeys! looks fun but they can be quite aggressive if they see that you have food. 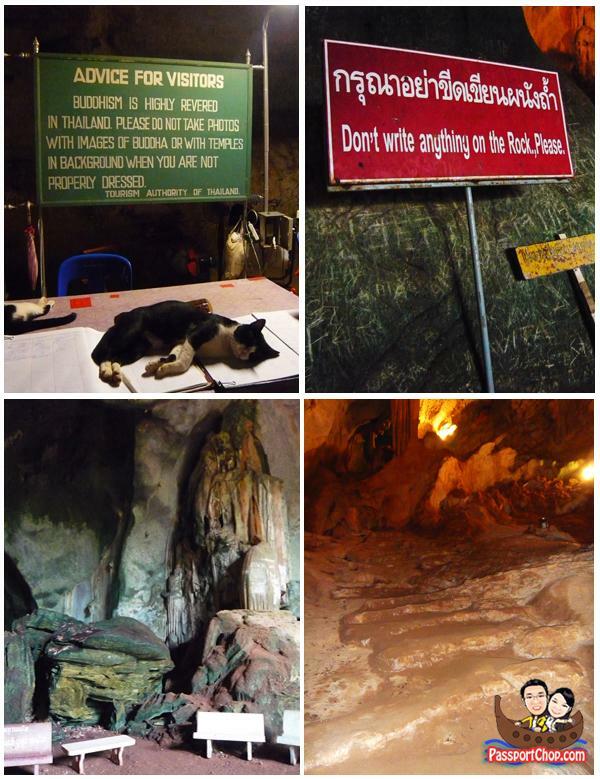 I never go to Suwan Khuha Cave Temple after read this blog I wanna go right now!. You shouldnt smile and show your teeth to the monkeys because they treat it like if you are agressive to them. I love Krabi and Phuket in Thailand. These place also the best choice for a tropical beach vacation and this is affordable and wonder place for enjoying holidays.